Sunday Mass during Lent has been different as people called “the elect” and “candidates” have been called forth to the altar. RCIA is mainly for these two groups of people: the unbaptized and baptized Christians seeking full communion with the Church. Our Church prepares to welcome these participants in the Rite of Christian Initiation of Adults (RCIA) through the Sacraments of Initiation (Baptism, First Holy Communion & Confirmation) at the Easter Vigil Mass. But RCIA is not only for those seeking full initiation into the Church; RCIA involves the whole Christian community. 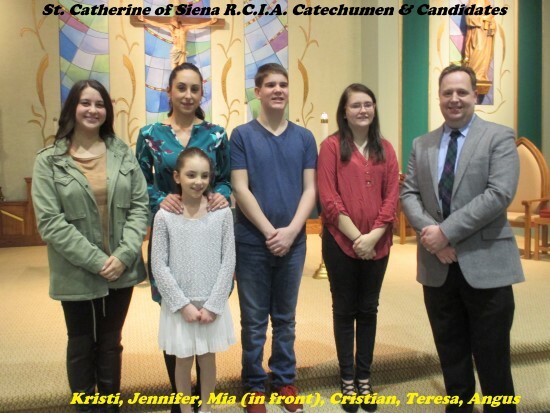 We invite our parish community to join us in celebrating the 3 scrutinies with our Catechumen (Elect) and Candidates as they journey closer to the Sacraments of initiation. As a Community we ask you to embrace, welcome and pray for them. On Sunday March 19, 2017 at the 10:00 AM Mass, Saturday March 25, 2017 at the 4:30 PM Mass and Sunday April 2, 2017 at the 10 :00 AM Mass we will celebrate the 3 Scrutinies. We also invite you to the Presentation of the Lord's Prayer at the Stations of the Cross at 7:00 PM on Good Friday, April 14, 2017 and the Easter Vigil Mass on Saturday April 15, 2017 at 7:30 PM. Scrutinies, Rites of Repentance and self-searching, offer the Catechumens the support they need to approach the waters of Baptism worthily. For those who are already baptized, the scrutinies invite us to embrace the same spirit of self-searching and repentance. At Easter we renew our baptismal promises as we see the Catechumens baptized. So during Lent we renew our repentance as we see the Catechumens scrutinized. The scrutinies remind us of the seriousness of our Christian life and inspire us to turn from evil and pursue good. They enliven our recommitment to Christ at Easter.